Store one bit of data on one single atom? Now, that's high density data storage. An international team led by IBM has created the world’s smallest magnet, using a single atom of rare-earth element holmium, and stored one bit of data on it over several hours. The achievement represents the ultimate limit of the classical approach to high-density magnetic storage media, according to a paper published March 8 in the journal Nature. 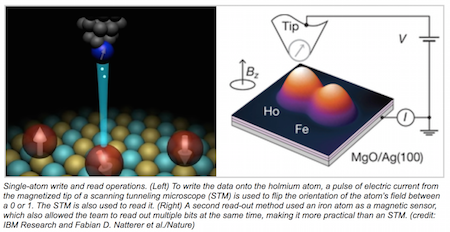 Using a scanning tunneling microscope* (STM), the researchers also showed that a device using two magnetic atoms could be written and read independently, even when they were separated by just one nanometer. The first time I ever heard of this idea was in Robert Heinlein's 1951 novel Between Planets. "It is theoretically possible to have a matrix in which each individual molecule has a meaning - as they do in the memory cells of your brain. If we had such subtlety, we could wrap your Encyclopedia Britannica into the head of a pin - it would be the head of that pin..."